A fake Army officer who obstructed the enforcement unit of Lagos Task Force from performing their legitimate duties around Lekki area has been arrested by operatives of the agency. Chairman of the Lagos State Task Force, Olayinka Egbeyemi, disclosed that the fake army officer was nabbed by the enforcement team of the agency during the demolition of shanties occupied by miscreants and hoodlums around White Sand School, Lekki, Lagos. Egbeyemi disclosed further that the suspect obstructed the enforcement team and beat-up one para-military officer attached to the agency. 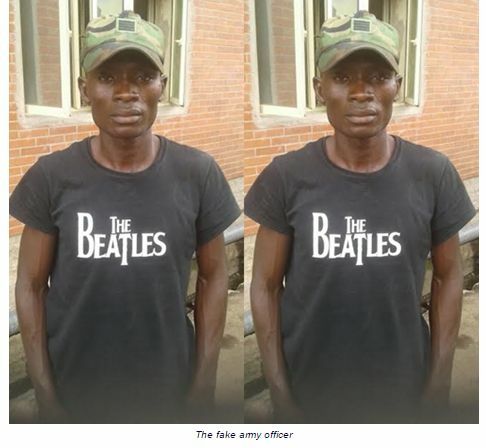 He said the suspect who claimed to be a Staff Sergeant in the Nigeria Army wore an Army cap on a mufti dress, saying that after diligent investigations, it was discovered he was a fake Nigerian Army officer who had been terrorising innocent members of the public around the area. He enjoined members of the public to stop impersonating security personnel as everyone had equal right before the constitution of the Federal Republic of Nigeria. Egbeyemi, however, confirmed that the Lagos State Commissioner of Police, Mr. Fatai Owoseni had directed that the suspect be immediately charge to court. The suspect, Usman Yaya, 27, from Hong Local Government Area of Adamawa State confessed that he stole the Nigeria Army cap from his brother in Abuja. Yaya confessed further that since he came to Lagos in February, 2017 and had nothing to do, he decided to put on the Army cap to extort money from people, particularly commercial buses plying Victoria Island and Lekki. He claimed that it was his brother (a Staff Sergeant with the Nigeria Army) whom he lived with at Abacha Barracks in Abuja, who owned the cap. Yaya pleaded with the government to temper justice with mercy as he was ready to stop the illegal dealings and return the Army cap to his brother in Abuja.